“My true devotee celebrates festivals for me in grand splendor with music, kirtan and discourses. He celebrates me with enthusiasm by taking me on processions and singing my divine Names”, so says Lord Krishna to Uddhava. When one visits Madhurapuri Ashram which is the abode of our beloved Thakurji – Madhuri Sakhi sametha Sri Premika Varadan on a Janmashtami day, one gets an experience of how this decree of Krishna is followed in letter and spirit to the fullest! Thakurji is the emperor of our Madhura Samrajya (empire of ‘sweetness’!) and it is only apt that his descent is celebrated every year as ‘Brahmotsav’. He eagerly waits for all his devotees to come pour in, and starting the Janmashtami day, for the next 10 days, this blissful Brahmotsav ensues. This year, being the 25th annual Brahmotsav, the celebrations were truly grand. The Bhagavata Bhavanam wore a festive look with traditional festoons – the ‘vidhaanas’, ‘pathaakas’ and ‘toranams’. The Utsav kicked off with special Bhajan and Tirumanjanam on the evening of September 3rd. As midnight struck, our beloved Guru Maharaj rang in the arrival of the divine newborn – Thakurji. He does become Nanda Baba, as he carries little Krishna and puts him in the cradle. Gopas and Gopis, young and old took turns to celebrate the arrival of Krishna. Sweets and savories offered to the Lord was distributed to one and all. Starting the next day, every morning Thakruji would set out on a procession in a palanquin. Bhagavatas, led by Sri Swamiji would render Kirtans in great Bhava as the procession would start from the Bhagavata Bhavanam, go to the Kalyana Srinivasa Perumal Temple, go to Jaya Hanuman Temple and return. Every day was different, be it the ‘alankara’ of the Lord, his style of being seated in the palanquin, his attire or the kirtans that were sung – one morning we would hear kirtans on Sri Bodendral, and on by Bhadrachala Ramadas, and on the third, enchanting Kirtans by Ammalu Ammal, and on another, Kirtans by Kannada Bhaktas. Indeed everything about Him is ‘nitya nootana’ (new every day), is it not? The second day morning was special. As Thakurji came out on his ‘Hamsa Vaahana’, there were gopas and gopis everywhere, celebrating Krishna throwing milk, curds, turmeric and other colored waters on each other. Some splashed balls of butter. The entire Madhurapuri Ashram had transformed into Gokulam. Right after the morning procession, Bhagavata ‘Patanam’ (reading) and ‘Shravanam’ (listening) would commence. Chanting and repeating each verse of Krishna Leela from Bhagavatam was a novel experience to all. This would also continue in the afternoon between 3-5pm. Every day, Sri Swamiji would discourse on Krishna leela from Bhagavatam. His nectarine words would be interspersed with beautiful kirtans by various Mahans like Oothukadu Venkata Kavi, Narayana Theerthar, Meera and many more, and their in-depth connotations. It was indeed a blessing to listen to Krishna’s ‘makhanchor lila’, ‘Venu Gitam’ and ‘Rasa Krida’ in Sri Swamiji’s words. During the day, the Bhagavatas also performed Ashtapadi Bhajans. Every evening saw Thakurji in a procession in a different Vahana – Sesha, Simha, Garuda, Kudirai (Horse) and so on as the procession went around the temples with Bhajans and kirtans. After the evening procession Bhagavatas would celebrate Krishna in a Divya Nama Sankirtan. Renowned Bhagavatas like Shri OS Sundar Bhagavata, Shri Udayalur Kalyanarama Bhagavata, Shri Setalapathi Soundararaja Bhagavata, Shri Cuddalore Gopi Bhagavata’s group, Srivanjyam Shri Muralidhara Bhagavata, Shri Gnanaguru Bhagavata, Shri A Srikanth Bhagavata and Shri Sattanatha Bhagavata led the Divya Nama Kirtan on different days. The Ekadasi and Dwadasi Days during the utsav were special. In the morning, there was special tirumanjanam. In the evening, when the Lord was taken on Garuda Vahana, the students from all the Veda Patashalas run by our mission had assembled there to chant the Vedas. All the four Vedas, the Upanishads, the Prabandhams of all 12 Azhwars, Ramanuja Nootrandhadhi and works of Acharyas were chanted in grand unison as the king of birds carried the Lord. Dwadasi day is the day of ‘anukaranam’ (enactment) of Govinda Pattabhishekam – the episode where Krishna lifted the Govardhan Mountain to protect the Gopas and Gopis from Indra’s wrath. The foothills of Madhurachalam, a hill that reminds us of Govardhan was where this was enacted. A separate Mantap was erected there. Early in the morning, Sri Swamiji performed Tirumanjanam to the Divine Couple at the venue. The elephant also came with the ‘Akasha Ganga’ and sprinkled it on the Lord with its trunk. The Lord was crowned as ‘Govinda’ and he came on a procession on the elephant’s back. The newly crowned king was accorded a royal welcome by Sri Swamiji with various Kirtans extolling Govinda. ‘Nikunja’ is a garden in Sri Brindavana where Radha Devi and Krishna spent time together. On one of the evenings, the hall was transformed into a Nikunja decorated with numerous fragrant flower garlands and lamps. Musicians like Balamuralikrishna, Bombay Sisters, Flute Ramani, Ranjani-Gayatri have offered their ‘kala kaushalam’ to the Divine Couple in the Nikunjam in the past. This year was unique – Whistle Wizard Sri Sivaprasad from Andhra Pradesh enthralled the Divine Couple and the audience through his unique whistle concert. It was time to celebrate the wedding of the divine couple. On the 8th day evening, the ‘Baarati’ or ‘Janavas’ procession was celebrated as a precursor to the grand wedding. The Bride and Groom were decked with various ornaments and flowers in separate palanquins. Distinguished Nadaswaram musicians gave their best Carnatic melodies to entertain the groom on his ‘Maapillai Azhaippu’ / Baarati. Amidst fireworks, the groom’s procession went around and finally returned to Bhagavata Bhavanam. The Bride walked gently from inside and it was time for the ‘proposal’! It is tradition that the bride’s father walks up to the groom and requests him to take his daughter’s hand in marriage offering ‘mani thengai’. Amidst Vedic chants, our Guru Maharaj did the honors and the ‘devas’ showered flowers on the Divine Couple. Now it was time for ‘Maalai Maatral’ or exchange of garlands, followed by ‘Oonjal’. Traditional rituals were performed by elderly women amidst divine music. The ninth day was Radha Kalyanam. The roof at the entrance of the hall was decorated like a huge garden and flower festoons and flower pots decorated the entire hall. There was a bevy of distinguished Bhagavatas that led the event. 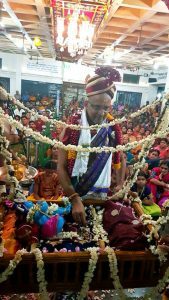 After Mahamantra Kirtan and Thodaya Mangalam/Guru kirtans, the Kalyana Ashtapadi and the other two Ashtapadis were rendered with great fervor. This was followed by the ritualistic Choornika, Pravaram, Lagnashtakam, Mangalya Dharanam and Nalangu. The Divine Couple were in their majestic best to grace the event and shower their grace the thousands of devotees present. Sri Swamiji gave thirtha prasad to all. In the evening, Rathotsav was held. 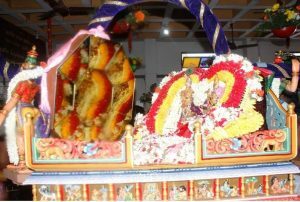 A traditional chariot built to house the Lord and clad with silver was ready at the entrance. It was decorated with flower strands. After the initial poojas to the Rath, Sri Swamiji brought the deities from their sanctum amidst divine music and chants of ‘Govinda’, ‘Govinda’ and ‘they’ ascended into the chariot. 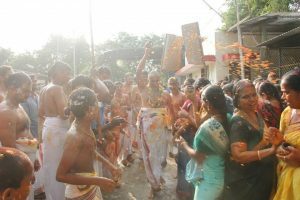 It was a blissful sight to see the entire village folk and all outstation devotees gathered there chanting Govinda Nama as they pulled the chariot forward led by Sri Swamiji. It was reminiscent of the Ratha Yatra at Tirupati as Sri Swamiji sang numerous Kirtans invoking the Lord at Tirumala. 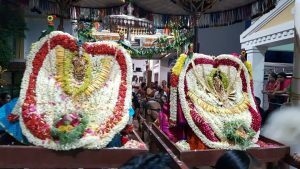 The Chariot moved about gently into the town of Mahanyam and about 3 hours into the procession, the chariot returned to the Ashram amidst upbeat Nadaswaram music. The 10-day Brahmotsav was coming to a close. 10 days passed like 10 minutes with Thakurji keeping his devotees on their toes every day in satsang. It was time for Thakurji to bid farewell to all his devotees who had come from near and far. 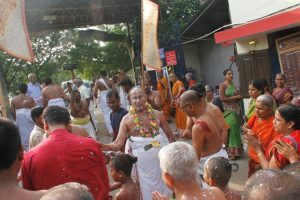 The day began right at sunrise, when devotees singing ‘Radhe Shyam..’ carried our Thakurji to the Madhura Theertham – the pond adjoining the temple where arrangements were done for ‘Avabrutha Snanam’ – this is a ceremonial dip in the holy waters taken by the Lord and His devotees at the end of a festival. Special Tirumanjanam was performed and everyone had a chance to get the ‘Snanam’ done through sprinkles of the holy water. Then it was time for our Divine Couple, the king of the kings, to visit all His ‘subjects’ and go around town! The visits started with Jaya Hanuman sannidhi. Thanksgiving to Lord Hanuman at the end of a utsav is conventional. The life-size Hanumanji who rises into the sky, in spite of all his strength and prowess, seemed to teach us all a lesson in humility, – with folded palms. And with Hanuman Chalisa, Anjaneya Utsav was celebrated. 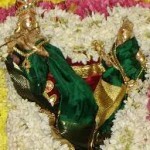 Thakurji also went to the ‘sthala Vruksham’ – the Peepul tree in the same premises and watered it. 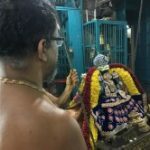 Next stop was the Kalyana Srinivasa Perumal temple. 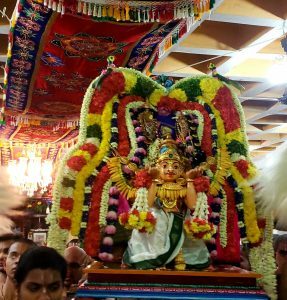 The Lord paid visit at every sanctum – Ganesha, Panduranga, Hanumanji, Varaha, Vishnu Durga, Srinivasa Perumal himself and finally Garuda as a thanksgiving for being an integral part of the Utsav. The Lord visited Tulasi Mata at the entrance of the Ashram and paid visit to the ‘Go Shala’ where the Go-Mata bless the Ashram with bountiful milk and love – making it verily Brindavan. Then He was accorded a grand welcome at the Bhagavata Bhavanam. It was time for all of us to place our heartfelt prayers at the Lord’s feet – ‘Lord! Please keep us in your service forever!’, ‘Protect me forever like you protect me today, Oh! Premika Varadha!’ – These were the prayers that were sung in the form of Kirtans as Thakurji was welcomed back to his throne. You must be pretty tired having ridden on the horse, Garuda, and elephant over the ten days! You must be weary having incessantly blessed all your devotees day in and day out all these days! So you may bid farewell to us all oh Krishna! A beautiful prayer in the form of a kirtan by Sri Swamiji is sung as the ‘marundu’ (herbal medicine/potion to cure digestion issues) – is offered to the Lord and distributed to one and all. Be it the discourses or processions or the kirtans or the bhajans, or the special events or the most delectable three-course meal provided three times a day to any number of devotees visiting the premises or the hospitality to the visitors – the 10-day event is always an incredible divine experience to cherish. 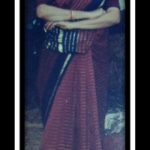 More than 25 years ago, Madhuri Sakhi and Premika Varadhan descended down amidst us so we could experience Guru Krupa and Krishna Krupa and to ensure that Mahamantra spreads to every nook and corner of the world. And by our Swamiji’s grace, as the Mahamantra spreads, they continue to take more incarnations and establish themselves wherever Mahamantra is chanted. Today, the Divine Couple have incarnated in all the Namadwaars and GOD Satsangs across the globe, where Mahamantra chanted. And just like Thakurji was celebrated with pomp and splendor at Madhurapuri, at Sri Swamiji’s behest, every Namadwaar and GOD Satsang around the world celebrated Brahmotsav for their own Thakurji during this time. Indeed the ‘Madhura Samrajya’ only grows with every Brahmotsav!